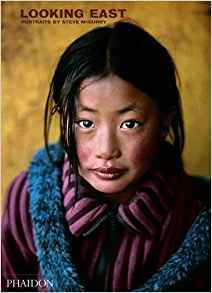 Looking East by Steve McCurry is a large-format paperback book offering an array of 75 of the very best of Steve’s beautiful and evocative portraits from across South and Southeast Asia. You might not recognise the name, but you will surely recognise at least one of his pictures. Steve McCurry is an American photographer who is perhaps best known for his 1984 photograph “Afghan Girl”, which originally appeared on the cover of National Geographic magazine. The young woman has haunting blue eyes and the look of a frightened yet proud doe. This is one of the most widely acclaimed portraits in the history of contemporary photography. Looking East has that same striking impact with each and every portrait. One is drawn into the moody, colourful, desperate, emotional faces – exotic and yet familiar. The collection includes iconic as well as lesser-known portraits of children, monks, pilgrims, and travellers that McCurry has met on his journeys throughout Afghanistan, India, Indonesia, Malaysia, Myanmar (Burma), Pakistan, and Tibet. Once again Steve has his focus on his subject’s eyes, be they care-worn or timid. This volume will be loved by photographers, who will admire Steve’s technical skill and composition. It will be pored over by artists who will draw inspiration from those characters captured by the camera. It will be sought after by travellers and even armchair travellers who dream of finding the last cultural vestiges in this fast-changing and often too-globalised world. Looking East by Steve McCurry is striking in every regard. The faces represent humanity in all its forms, and each one is unique and expressive. There is hardly any text – the portraits illustrate the narration, and the book is no worse for that.